While sweating during exercise or hot weather is normal, some people experience intense sweating for other reasons, including shyness or habits such as eating hot foods. 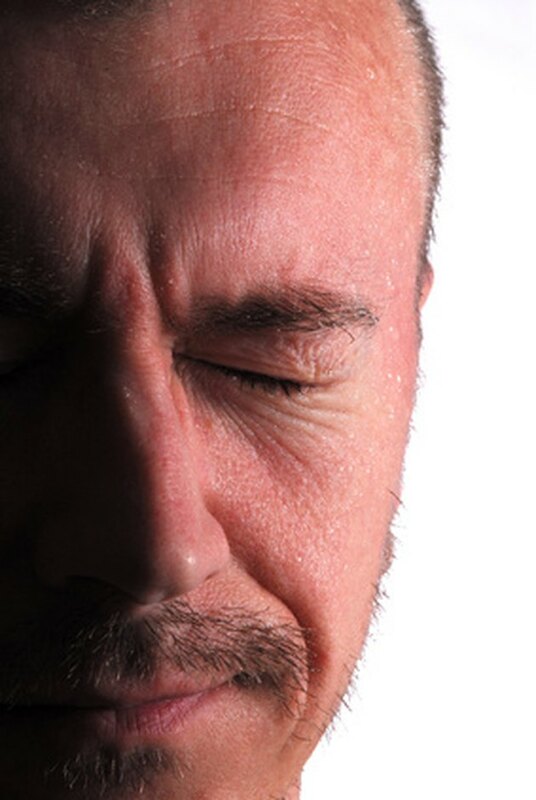 Excessive sweating can be embarrassing and lead to problems with self-esteem. For women who wear makeup regularly, facial sweating can be an annoyance. Identify things that make you sweat and try to avoid them. According to Mother Nature, caffeine, spicy foods and alcohol can all increase the production of sweat. Hot drinks will also cause you to sweat, especially in hot climates. You might also sweat when you're under stress or feeling embarrassed. Anticipate these situations so you can deal with them. For example, take a few minutes for deep-breathing exercises or step away from the situation so you can calm down. Wash your face with cold tap water or fill a bowl with water and a few ice cubes. Splash your face repeatedly and allow to air dry or pat gently with a towel. Or, take a cold shower, as this will cool down your whole body and also reduce sweating. According to Ayushveda, cold water closes pores, reducing sweating. Drink cold water, dress in loose-fitting cotton clothing and avoid the sun as much as possible. When indoors, keep the room cool and well ventilated. If you feel your body's temperature raising, wash your face and neck with cold water to cool down. Ask a dermatologist to prescribe a cream containing glycopyrrolate, an ingredient that can reduce sweating. These creams are the equivalent to prescription-strength antiperspirants, but they're made for use on the face. According to the Hyperhidrosis Center website, the cream can help reduce the amount of sweat produced, as well as the number of episodes of intense sweating. Talk to your doctor about Botox. Because the Botulinum toxin is used to relax muscles, it can reduce sweating. The injections are mostly used to treat underarm sweating, but can also be used to treat facial sweating. Regular treatments every few months are needed to maintain effect.